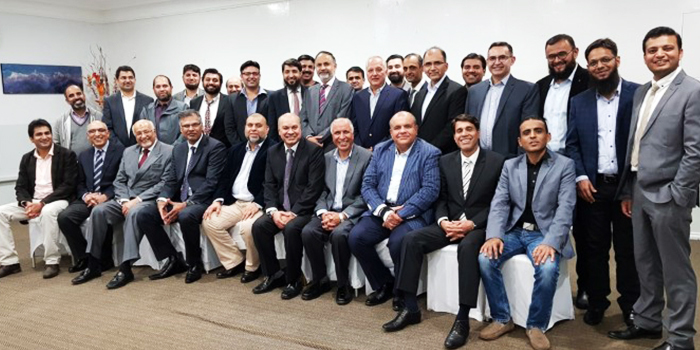 Australia Pakistan Chambe hosted a dinner in the honour of IT Delegation from Pakistan which is participating in CeBIT expo Darling Harbour Sydney from 14 to 16 May 2018. The delegation led by Mr Sulman Hassan Director, Pakistan Software Export Board with members of the participating company’s representative from various IT companies from Pakistan. The IT delegation is here to explore business opportunities in Australia with a focus on IT exports from Pakistan. Mr Muhammad Asif, President APCTCI in his opening speech welcomed the delegates and paid special thanks to Mr Abdul Majid Yousfani, Consulate General of Pakistan for accepting their invitation to attend the dinner. Although it was a very short notice to arrange this dinner but even then, prominent members of the Australian Pakistan community spared their valuable time to attend this dinner. It was attended by Mr. Hasan Kanji Honorary Investment consul, Mr Asad Jatoi, TDO, Mr Asif Iqbal, Mr. Sohail Shamsi, Mr. Faisal Shamsi and many other prominent business men. The other chamber members comprising of Ejaz Paracha, VP, Mohammed Abid, Treasurer. Faheem Jafar Joint secretary, Adnan Nasir Member executive committee, Habib Ur Rehman, Member executive committee were also present in this dinner. The Consul General of Pakistan in his address guided the members of delegation that how to get the business in Australian Market. He said there is a potential in IT market but prices and service standard should be maintained to grab the business opportunities. He advised that any delegation planning to visit Australia should submit their visa application before time in order to avoid delays in getting the visa. He appreciated the wisdom of the young IT professional who is putting their full efforts to make this trip useful. Mr Sulman Hassan, in his speech informing that the delegates have been able to identify the business opportunities in Australia. He also mentioned the importance of cooperation at the level of Pakistan Consulate to make this visit successful. In the end Mr Muhammad Asif, President APCTCI thanked all participants who attended this dinner in such a short time and also Mushtaq Ahmed who provided the scrumptious food.